Welcome to the World of Sandplay! On this site you will ﬁnd educational video materials and sandplay therapy training information that address your interest in Sandplay Therapy. Sandplay Video Productions offers instructional DVD’s about Sandplay and related topics, with interviews and lecture material created by leading Sandplay therapists and teachers. The material is designed to stimulate your personal exploration of sandplay therapy, as well as your professional interest in sandplay therapy training. These videos will provide support for your sandplay therapy trainings and presentations, in addition to giving clients and parents information about the sandplay process and how it works. We hope you ﬁnd them useful. Please let Sandplay Video Productions know if there are particular topics or areas of study you would like to see addressed. We are developing organically, and in response to your feedback and interest. Our aim is to support and encourage the growing interest and healing possibilities of sandplay therapy. Thank you for visiting! Created by Sandplay Video Productions. Dr. Morena answers questions posed by parents and educators about Sandplay, and explains how it can relieve emotional distress and empower the psyche to re-establish inner harmony. She demonstrates holding a safe and protected space for an adult client, and includes personal examples to show how this powerful process can transform internal confusion and heal emotional pain. 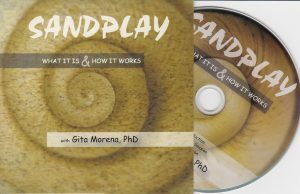 Produced by Gita Morena, Phd, ‘Sandplay: What It Is & How It Works‘ is the ﬁrst DVD available from Sandplay Video Productions. 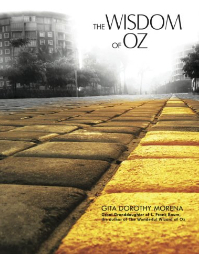 Dr. Morena is a transpersonal psychotherapist, licensed Marriage, Family and Child Therapist, certiﬁed Sandplay therapist-teacher (ISST/STA) and mindfulness meditation teacher practitioner. 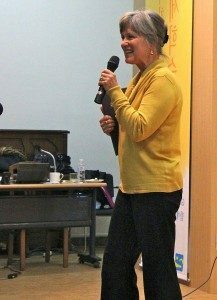 She has specialized in Jungian Sandplay therapy since 1988, and lectures around the world about Sandplay therapy training, psychotherapy, and the mind-body-spirit connection. Her multi-dimensional teaching style is creative, informative, and stimulating. 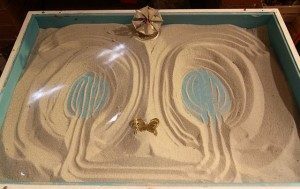 Sandplay is a non-verbal therapeutic modality that allows the psyche to express itself without words. 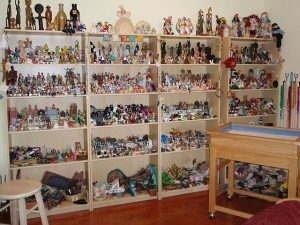 By creating scenes in the sand with small images and ﬁgurines, a person is able to express feelings directly and release what has been hidden deep in the recesses of the unconscious. The power of Sandplay comes from an understanding of archetypal symbols and symbolic language, as well as the symbolic messages contained in the sand scenes. 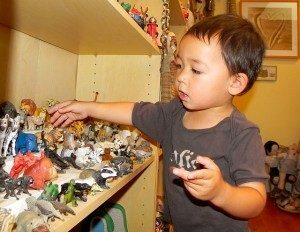 Understanding the language of symbolic imagery and using Sandplay effectively in therapeutic settings requires extensive training and education. See Resources for more information about sandplay therapy training programs and educational materials.